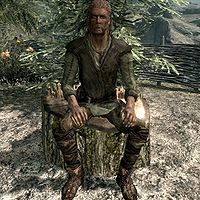 Kjeld is a Nord citizen and an innkeeper living in Kynesgrove. He runs the local Braidwood Inn with his wife Iddra. Normally he does not provide any services, but if Iddra dies, he will take over renting out the inn's rooms. Kjeld also spends time working in Steamscorch Mine and at the town campfire with the other villagers. He may purchase any malachite ore you have, which he suggests mining from Steamscorch Mine. His son, Kjeld the Younger, also lives in Kynesgrove and mentions that his father runs the town. He sleeps from midnight to 2am, then heads to Steamscorch Mine to work for 4 hours before taking a break, having a one-hour breakfast at 6am. He goes to work again between 7am to 10am. After this, his workday ends and for the rest of the day he can be found hanging around near the town campfire or Braidwood Inn. At 6pm he has a one-hour dinner. He wears a set of farm clothes and a pair of boots. He is equipped with an iron dagger, and carries a selection of upper-class items and gold. He may greet you with "Welcome to Kynesgrove. If you want to do business here, you'll have to deal with me. ", "If it's malachite you're after, you've come to the right place. I'll pay for any you dig up out of Steamscorch Mine." He may also tell you, "Kjeld speaks for Kynesgrove. Anyone who says otherwise is aching for a fight. ", "Roggi and I do the work around here. My wife and brats just sit around on their brains wasting time. ", and "My wife is a good woman, but every man needs a little variety, you know?" If you ask him to tell you about Kynesgrove, he will disparage the locals, saying, "A bunch of lazy rabble trying to make a living. Can't get better workers in because everyone's afraid of the tomb up above the mine. Dead dragons... it hasn't moved since Ysgramor and it's not going to start now. Superstitious milk drinkers." If you have killed Sahloknir as part of the quest A Blade in the Dark, Kjeld's answer will be different: "So it seems the milk drinkers were right. That dragon was nearly the death of us. All we can do now is rebuild." Roggi: "You going to be at the inn tonight?" Kjeld: "Not sure. Feeling like taking another trip." Roggi: "What's your wife think of your trips?" Kjeld: "They're none of her business, and none of yours either." Roggi: "I'd like the fresh air better, but this isn't so bad." Kjeld: "How do you stay cheery down in these blazes?" Roggi: "I don't know. Maybe because it makes the mead taste that much better at night." Kjeld: "Again with the mead!" Roggi: "Found another one of those vents in back near the scaffold." Roggi: "She hasn't had a chance to look at it yet. Just be careful over there." Kjeld: "So, Roggi, when are you going to get yourself a woman?" Roggi: "Oh, I'm not sure I could ever settle down like you have, friend." Kjeld: "Who says I've settled down?" Roggi: "I think this is yet another conversation that wouldn't make your wife happy." Kjeld: "That's just it... if she's not happy, there are plenty of other women who will be." Roggi: "Oh, you old charmer." Roggi: "I'm not sure that's a good joke to tell with women present..."
Kjeld: "But don't you get it? She thought he was a troll!" Roggi: "I get it. It's funny. It just might upset your wife." Kjeld: "Eh, let her get upset. She'll be angry no matter what I say, might as well enjoy myself." Roggi: "How much do you know about the brewing of mead?" Kjeld: "I know all there is to know about the drinking of it, and that suits me just fine." Roggi: "I've been trying to figure out what makes Riften mead better than the stuff from Whiterun." Roggi: "There has to be more to it than that, though. I wish I knew where the bees got it from." Kjeld the Younger: "When do I get to go hunting?" Kjeld: "When you're able to draw a bow all the way to your shoulder." Kjeld the Younger: "I can do that! I did it yesterday!" Kjeld the Younger: "So can I come?" Kjeld the Younger: "And then I told her about the vampires and how much they would pay me for her." Kjeld: "That is rich. What did she do?" Kjeld the Younger: "She's a girl. She cried." Kjeld: "It's good to toughen her up. Not an easy world out here. Keep at it." Kjeld the Younger: "Papa, mama's making me do kitchen work again." Kjeld: "And what did you say to that?" Kjeld the Younger: "She can't tell me what to do!" Kjeld: "There you go, son. Be your own man!" This page was last modified on 6 June 2014, at 21:40.